The Simmons Beautyrest Premium Universal Low Profile Bed Frame delivers the structure and support your bed deserves. The frame easily adjusts to fit any size mattress from Twin to Eastern King, so you can keep the same frame if you decide to buy a different size mattress. With durable steel construction, this metal bed frame supports up to 3,000 pounds. No tools are required for easy assembly. The Beautyrest Premium Universal Low Profile Bed Frame has many exciting features for users of all types. 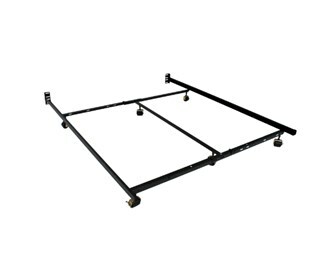 The Beautyrest Premium Universal Low Profile Bed Frame is sold as a Brand New Unopened Item.